It pays to have Klout! Seriously, it pays to blog! Well, mostly in freebies so far! Last month I told you all about the Poshly Custom-Tailored Freebies I received. I’m still giving those products a good testing, so I’ll have reviews for them soon I hope! Since then (okay, and a bit before that) I’ve been paying more attention to Klout, more specifically the Perks section. Klout has come through with a variety of perks that suit the variety of things I blog about perfectly! First, it was Blowfish for Hangovers. I intended to give it a good try after my planned Halloween shenanigans, but I ended up with a cold so I didn’t drink. I think I’ll be really tying one on at Thanksgiving, so let’s hope I’ll be able to test on good old Black Friday! 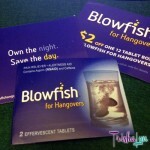 Check out Blowfish for Hangovers on Twitter! Next, I was invited to host a #RTGirlsNightIn and provided with a fantastic set of makeup brushes from Real Techniques by Samantha Chapman. My small Girl’s Night was a success and the brushes are fabulous! I haven’t worked with makeup brushes this nice since I was doing stage makeup in college, and let me tell you, it makes a difference! 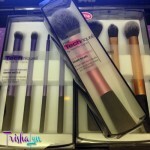 I’m stoked to have these brushes and I think I converted a few of my friends! Check out Real Techniques on Twitter or Real Techniques on Facebook! Changing gears from beauty products, the next Klout Perk I received was 50 custom business cards from MOO Cards. Again, I’m totally a believer in MOO now! Coming from a background working for a professional printing company for 5 years, I’m very picky about the quality of my business cards and where I get them from. I remember getting a set of cards from MOO when they first came out, back when you could only get the very small cards (I think they’re still in a drawer somewhere in the recesses of my desk!). 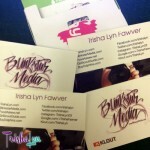 I’m super happy that the printing looks good, the stock is nice and thick, and even the obligatory Klout logo looks good! More on these in a later post, but in the meantime, check out MOO Cards on Twitter or MOO Cards on Facebook! Back to beauty, just today I received TWO packages – a Klout Perk from Freeman and my very first Vox Box from Influenster! 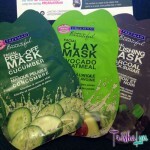 The Freeman Perk contained three lovely masks with a great card full of suggestions for creating a Multi-Mask routine for folks like me with combination skin (i.e. oily in some places, dry in others). There’s a Freeman Feeling Beautiful Cucumber Facial Peel-Off Mask, an Avocado & Oatmeal Facial Clay Mask, and a Charcoal & Black Sugar Facial Polishing Mask! The first two I’ve seen on shelves before but haven’t tried yet and the third I’ve plain never seen! I can’t wait to try them out! Check out Freeman Beauty on Twitter, Freeman Beauty on Facebook, or Freeman Beauty on Instagram! I have more Klout Perks coming to tell you about soon! Check out the brands who were kind enough to send me some stuff to try! You can also give me more Klout by giving me a +K on these topics and check out my Influenster profile too! Disclosure: I was given complimentary products or samples because I’m a Klout influencer. I am under no obligation to receive the sample or talk about these companies. I get no additional benefits for talking about the product or companies. Affiliate links for the products are contained in this post. Will There Ever Be A Yahoo – Google Partnership? 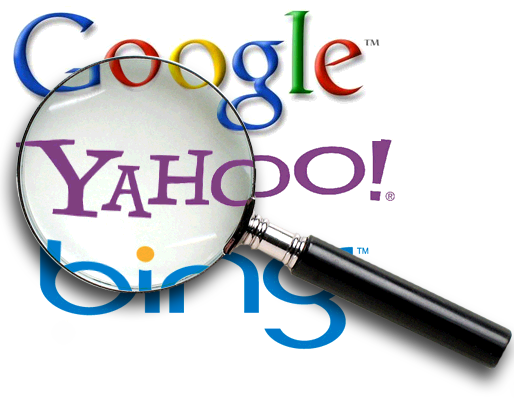 Before Google dominated the search engine market, the #1 place to go for information on anything was Yahoo. No one could go outside or watch TV without seeing one of their ads each day. Today, Yahoo is not in good shape. Some internet users either think it’s dead or have no idea what it is. At one point, a few companies tried to buy the company but the execs and shareholders refused the offers. However, no one has thought of a partnership. Will Yahoo ever do such a thing with Google or someone else? The short answer is maybe. Yahoo could use some help in some form or another. Their net income is at $228.5 million according to their Q2 2012 earnings report, which has been in decline for some time. They’ve also had many of their top-level execs either leave or have been let go over the past six years. Add on the fact that they’re having to compete for business with two juggernaut-sized companies (Google and Microsoft) and it becomes clear that Yahoo has a massive hill to climb if they wish to stay open. A partnership of some could work in their favor, but it depends on what the other party would offer them. The first thing they need is more people using their search engine. Without that, there’s not much of a reason to visit except to check e-mail and read the news. Original content would also help. If Yahoo offers something people want to see or read that can’t be found elsewhere, there’s a good chance that they’ll be able to convince users and investors to give them a second look. In short, they’d have to utilize multiple services from one company or team up with multiple companies to remain afloat. 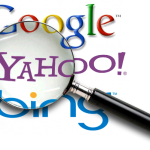 At some point, Yahoo will have to do something big to attract the attention of internet users and businesses alike. If they can’t offer better services and content than its competition, it’ll have to put itself up for sale and hope for the best. A partnership with Google would help, but only if it’ll convince people to come to their site on a regular basis aside from checking and sending email. Also, it’ll depend on which services the partnership will improve. Otherwise, the deal may turn out to be an expensive waste of time for all parties involved. One way or another, Yahoo needs to get its house in order. Will that include a partnership of some kind? Only time will tell. Given the history they’ve had when it comes to being bought up, the folks in charge may choose to do things on their own until all of their efforts fall flat before striking a deal with anyone. Dan Chaney is a blogger for HirePulse advertising with a background in social media and marketing. Guest Post by James Clark. Social networking sites for smartphones are what make the smartphone experience all the richer. You can get the entertainment and socialization aspects of using a full time PC all in a handy device that is not only portable but can be safely tucked into your pockets or bags. Modern technology really can be a blessing but availing the luxuries can be a bit tricky. With so much progress happening on the smartphone front, there is also a lot of malware and spyware being produced too- – a counter reaction almost for all the things you can use smartphones for. Of all the platforms for smartphones, iOS ranks number one when it comes to safety. There is just no doubt that an iPhone is the safest platform what with the closed OS and Apple’s strict review policies for apps. So if you feel that you want a social app experience and are safe from cell phone monitoring, keyloggers, and all sorts of malware and adware that spreads through social networking sites, iPhone is your best option. And so, here are the best social apps that will help you socialize with ease and no fear of spyware on your iPhone. There can be no surprises here. Facebook is King App when it comes to comparing social networking apps for any platform. When we talk about iPhone, we know that the people over at Apple have managed to master social networking app creation and have a great free app version on iTunes. 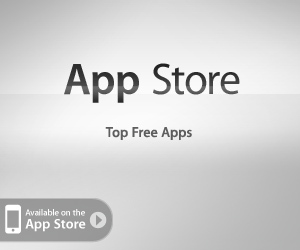 The app is very close to the real website and offers almost everything that is available on the site. The rating is 5 out of 5 and is the most used social app on iPhone. Though Meebo also has an excellent rating (5 out of 5 like Facebook), it still will have to come in a close second behind Facebook since the latter’s preference outdoes anyone else’s. But what is great about Meebo is that you can use it and still avail Facebook chat along with dozens of other chat services all rolled into one iPhone app. The app is free and very easy to use. This is a great app that also allows you to keep in touch with friends through multiple social network platforms and services. Among services it incorporates are AOL, MSN, Facebook, MySpace, and many more. Unlike Meebo, it supports Skype which gives it an edge over some other apps for Skype fans. IMO Instant Messenger is free and allows users to sort out and organize contacts, user push features, search chat history and more. The rating for this app is 4.5 out of 5 but personally, this app is a better option than Meebo. This is a favorite among Twitter fans. Though it’s the free version of the Twitter app, fans flock to it since it does offer a lot of good features despite holding back many for the users on the paid version. With TweetDeck users can manage more than one Twitter account on one simple interface. The ranking is 4/5 and hard to beat for a free Twitter app. Now this app is quite possibly the most comprehensive one when it comes to accessing multiple services. Instead of just incorporating the big names, users can also keep tabs on Tumblr, LinkedIn, and Instagram. All the news feeds come to the users in magazine style updates, keeping everything fresh and fun. Flipboard ranks great with a 5 out of 5 rating. James Clark has been in the business of providing quality information on Mobistealth Mobile Spy Software for a while now. He’s an expert at all things spyware, but his main forte is iPhone spyware which has captured the interest of many. Guest Post by Samantha Gray. Facebook and Twitter are still the most popular social media platforms that internet marketers like to use in order to win over young consumer (who are often said to be the most difficult target audience to attract because they’re “picky). But if they’re smart, internet marketers should now be investing a little bit more of their time and effort using a new and upcoming social media site called Pinterest—aka “a marketer’s dream.” That’s because young consumers who love to shop (mostly women but some men too) flock to Pinterest on a daily basis ready to spend their disposable income. Ok, so the social media/image bookmarking site isn’t that new (it was established late last summer) but with every passing month the site just continues to get more and more users. Currently there are about 10.4 million registered users, according to the most recent statistics available. And like mentioned earlier, most of the users are young— the same young users who refuse to succumb to your marketing techniques on Facebook but fall for them on Pinterest. It’s not really sure why this is the case, but the fact that Pinterest is bit more transparent might be the reason. Users know that its purpose is to connect buyers with sellers. Like the name suggests, Pinterest is a digital pin board that requires users to scour a collection of highly attractive images called “pins.” These pins can be of any item that interests them. For example, if a user thinks a dress featured in the database is extremely cute then he or she can pin it on their profile/ “board.” If they think the couch is to-to-die for and would love to own it one day, they can pin it on their board too. It’s great when looking for inspiration for weddings and other events too. So where does the cash flow in? A smart marketer will make sure that the image is linked to the coinciding store or blog where that specific item in the photo can be purchased or at the very least taught how to make—recipes for example are also extremely popular on the site. Since users can pin whatever they like, marketers don’t seem so pushy because in a way the users are coming to you—unlike Facebook where marketers are invading a user’s Timeline with updates and can be easily seen as annoying. Of course, it’s your job to make sure you have the most aesthetically pleasing photos of your product and/or services available so someone will want to pin you on their board. How else can it be effective? While a user can purchase the item they pinned directly, a user’s friends can make purchases too. Firstly, they can take a peek a specific user’s pin board so they know what items their friend might like come Christmas or their birthday. Secondly, Pinterest integrates with Facebook and Twitter so that users can post their pins on these sites as well. This means that even someone who doesn’t have Pinterest (but has a Facebook or Twitter account) can see a Pinterest pin. If they like what they see, they can purchase the item too. This means you get to expand your target audience without doing too much. Pinterest users will do it for you. In sum, Pinterest can be a really useful marketing tool to invest in. Standing out on the Internet can be a troublesome process. When a person has a significant amount of competition, it is easy to give up. However, if a person utilizes a social media website, it is possible to garner benefits. If a person wishes to gain as many followers as possible, it is crucial to remain active. A person should not create a social media account and then pay little attention to it. People may lose interest in the account. If this is not the case, potential customers may assume that a business is no longer active. A person should ensure that recent information is always available. It is also a smart idea to ensure that the information is helpful and informative. Popular people on social media websites tend to interact with followers; they answer any questions that they may receive. They talk to people and update them on certain events and issues. Emulating these popular social media individuals is a plan to keep in mind. It is necessary for people to feel that they are important. They should have the impression that their comments and opinions are valid. If a person feels acknowledged, he or she may tell friends and family members. When a social media account owner takes these steps, they will receive more followers. They will gain more attention in the long run. A business or individual may wish to link to a blog or other website. When a person chooses to do this, potential readers and customers may discover the website. The link to the website may be placed in a profile area of a social media account. If this is not possible, daily entries may provide a link to the website. It is vital to exercise caution; a person should not link to the website too frequently. Many people may assume that the business is unprofessional or desperate. Restraint should be practiced. It is not enough to link to a website. If a person wishes to gain further success, he or she should advertize upcoming activities. If a business is releasing a new product, the product should be discussed on the social media site. Some people will appreciate the gesture and reward the owner in the long run. A business may wish to reward followers by providing exclusive discounts and other incentives. When a person chooses to do this, the online presence of the business will improve. People will be aware of the business; they will wish to share information with people around their community. If a person or business wishes to reach the same level of success as Charles Phillips, Jr., the information above should be kept in mind. A willingness to try new things is paramount, and giving up is not an option. The Internet has many possibilities. It is a terrific idea to utilize this medium. When you are trying to promote a site for your business or for a cause, it is important to promote its visibility as much as possible. This often involves you signing up for social networking sites like Facebook and Twitter. Recently, Google+ has become a popular social network that many webmasters and businesses are turning to for promotion. Here are a few things to consider about the true value of Google+. If you have a local business, you will definitely need a Google+ account, so that you can take advantage of Google Places. Google Places was a service offered by Google, which made it possible to promote your business listing for local searches. Recently, Google moved all of the Google Places accounts over to Google+ accounts. This means that if you want to participate in this program now, you have to have a Google+ account. This makes it possible for you to reach customers in your local market for free and interact with them. One of the nice things about using Google+ is that you can connect with other people in many different ways. For example, you can form circles of different types of contacts. You can set up “hang outs” where you can video chat with a group of people. You can send direct messages, public messages, and chat with people as well. If you are trying to increase visibility, and get to know your customers, this can be a good way to go about it. If you are a webmaster, you also have the opportunity to integrate Google+ features right into your site. There are various widgets that you can put into your site with just a few clicks. For example, if you have a Brain Host hosting account, you’ll be able to integrate Google+ buttons easily onto your pages. This makes it easier for your website visitors to interact with your Google+ profile, and for Google+ visitors to find your site. If you are serious about developing an online presence for your business or website, you owe it to yourself to open a Google+ account. It is the latest social network to make a splash online, and it is growing quickly. While it is yet to unseat Facebook as the undisputed king of social networking, it can provide you with some benefits for your business.